War On Terrorism: Our Honored DeadThe following Soldiers of the 25th Infantry Division have made the supreme sacrifice in the War on Terrorism. We remember them with honor and respect. SPC Gabriel D. Conde 3rd Bn. (Airborne), 509th Inf. Regt. SSG David Thomas Brabander 3rd Bn. (Airborne), 509th Inf. Regt. SPC Daniel L. Carlson 3rd Battalion, 25th Av. Regt. CW2 Suresh N. A. Krause 2nd Battalion, 25th Av. Regt. CW3 Brian D. Hornsby 2nd Battalion, 25th Av. Regt. SGT Luis A. Oliver Galbreath 2nd Battalion, 25th Av. Regt. SGT Richard A. Essex 2nd Battalion, 25th Av. Regt. SPC Ethan Jacob Martin 1st Squadron (Airborne), 40th Cav. Regt. SSG Carl Eric Hammar 1st Battalion (Airborne), 501st Inf. Regt. PFC Nathan Tyler Davis 1st Battalion (Airborne), 501st Inf. Regt. PFC Vincent J. Ellis 1st Squadron (Airborne), 40th Cav. Regt. SP4 Alex Hernandez III 3rd Battalion, 25th Av. Regt. SSG Thomas Kent Fogarty 3rd Bn. (Airborne), 509th Inf. Regt. 2nd Battalion, 25th Av. Regt. SPC Jeffrey Lee White 1st Battalion (Airborne), 501st Inf. Regt. 2LT Clovis Tim Ray 2nd Battalion, 35th Infantry Regt. PFC Dustin Paul Napier 1st Battalion, 24th Infantry Regt. SGT Joseph Altmann 2nd Battalion, 27th Infantry Regt. SPC Ronald H. Wildrick, Jr. 2nd Battalion, 35th Infantry Regt. SPC James R. Burnett 1st Battalion, 5th Infantry Regt. PFC Matthew C. Colin 1st Battalion, 5th Infantry Regt. SFC Johnathan B. McCain 1st Battalion, 5th Infantry Regt. SPC Calvin Matthew Pereda 1st Battalion, 5th Infantry Regt. SSG Houston M. Taylor 2nd Battalion, 27th Infantry Regt. PVT Danny Chen 3rd Battalion, 21st Infantry Regt. 5th Squadron, 1st Cav. Regt. SPC Ryan J. Cook 3rd Battalion, 21st Infantry Regt. SGT Rodolfo Rodriguez Jr. 3rd Battalion, 21st Infantry Regt. PFC Brett Everett Wood 1st Battalion, 5th Infantry Regt. (posthumous promotion to Specialist) 1st Battalion, 5th Infantry Regt. SPC Douglas Jay Green 3rd Battalion, 21st Infantry Regt. 3rd Battalion, 21st Infantry Regt. PFC Douglas Leonard Cordo 1st Battalion, 24th Infantry Regt. SPC Jinsu Lee 2nd Battalion, 27th Infantry Regt. SSG James M. Christen 2nd Battalion, 27th Infantry Regt. SGT Jacob Molina 2nd Battalion, 27th Infantry Regt. SFC Kenneth B. Elwell 3rd Battalion, 21st Infantry Regt. PFC Tyler M. Springmann 3rd Battalion, 21st Infantry Regt. SPC Kevin J. Hilaman 2nd Battalion, 35th Infantry Regt. 1LT Dimitri A. Del Castillo 2nd Battalion, 35th Infantry Regt. SPC Levi E. Nuncio 2nd Battalion, 35th Infantry Regt. PFC Joshua L. Jetton 2nd Battalion, 27th Infantry Regt. PVT Ryan Jeffrey Larson 1st Battalion, 5th Infantry Regt. SGT Jeffrey C. S. Sherer 1st Battalion, 24th Infantry Regt. 2nd Battalion, 27th Infantry Regt. SPC Brian D. Riley, Jr. 2nd Battalion, 35th Infantry Regt. SGT Kevin White 2nd Battalion, 35th Infantry Regt. SGT David J. Luff, Jr. 1st Battalion, 27th Infantry Regt. SSG Phillip Chad Jenkins 1st Battalion, 27th Infantry Regt. PFC James Flint McClamrock 1st Battalion, 27th Infantry Regt. SGT Jamal M. Rhett 1st Battalion, 21st Infantry Regt. CW2 Mathew C. Heffelfinger 2nd Squadron, 6th Cav. Regt. CW2 Earl R. Scott III 2nd Squadron, 6th Cav. Regt. SPC Julian L. Berisford 3rd Bn. (Airborne), 509th Inf. Regt. 1st Battalion (Airborne), 501st Inf. Regt. SSG Clayton P. Bowen 1st Battalion (Airborne), 501st Inf. Regt. PFC Morris L. Walker 1st Battalion (Airborne), 501st Inf. Regt. PFC Nicolas H.J. Gideon 1st Squadron (Airborne), 40th Cav. Regt. PFC Justin A. Casillas 3rd Bn. (Airborne), 509th Inf. Regt. PFC Aaron E. Fairbairn 3rd Bn. (Airborne), 509th Inf. Regt. 1LT Brian N. Bradshaw 1st Battalion (Airborne), 501st Inf. Regt. CSM Benjamin Moore, Jr. 2nd Battalion, 27th Infantry Regt. SPC Michael J. Anaya 2nd Battalion, 27th Infantry Regt. PFC Patrick A. Devoe, II 1st Squadron (Airborne), 40th Cav. Regt. 1LT Daniel B. Hyde 2nd Battalion, 35th Infantry Regt. PFC Zachary R. Nordmeyer 5th Squadron, 1st Cavalry Regt. SPC Micheal B. Alleman 5th Squadron, 1st Cavalry Regt. CPL Michael L. Mayne 5th Squadron, 1st Cavalry Regt. PVT Sean P. McCune 2nd Battalion, 35th Infantry Regt. 3rd Battalion, 7th Field Artillery Regt. See Project Compassion portrait 1st Battalion, 5th Infantry Regt. SPC Heath Pickard 1st Battalion, 5th Infantry Regt. PFC Christoper McCraw 1st Battalion, 21st Infantry Regt. See Project Compassion portrait 1st Battalion, 14th Infantry Regt. SPC William L. McMillan III 1st Battalion, 21st Infantry Regt. SGT John K. Daggett 1st Battalion, 14th Infantry Regt. SPC Jeremiah C. Hughes 1st Battalion, 21st Infantry Regt. SPC Gregory B. Rundell 1st Battalion, 27th Infantry Regt. SGT Gary D. Willett 1st Battalion, 21st Infantry Regt. SGT Timothy P. Martin 2nd Squadron, 14th Cav. Regt. See Project Compassion portrait 1st Battalion, 21st Infantry Regt. See Project Compassion portrait 1st Battalion, 27th Infantry Regt. 1st Squadron (Airborne), 40th Cav. Regt. SGT Alexander Gagalac 2nd Battalion, 27th Infantry Regt. CPT Derek A. Dobogai 2nd Battalion, 35th Infantry Regt. See Project Compassion portrait 2nd Battalion, 35th Infantry Regt. SGT Garrett I. McLead 2nd Battalion, 35th Infantry Regt. CPL Jeremy P. Bouffard 2nd Battalion, 35th Infantry Regt. CPL Phillip J. Brodnick 2nd Battalion, 35th Infantry Regt. CPL Nathan C. Hubbard 2nd Battalion, 35th Infantry Regt. SPC Michael A. Hook 2nd Battalion, 35th Infantry Regt. 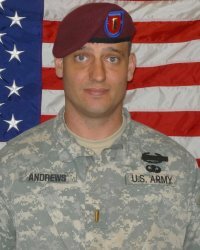 SGT Shawn G. Adams 3rd Bn. (Airborne), 509th Inf. Regt. 1LT Keith Heidtman 2nd Squadron, 6th Cav. Regt. CWO Theodore Church 2nd Squadron, 6th Cav. Regt. PFC Casey P. Zylman 3rd Squadron, 4th Cav. Regt. 3rd Battalion (Airborne), 509th Inf. Regt. See Project Compassion portrait 1st Bn. (Airborne), 501st Inf. Regt. 1st Lt. Colby J. Umbrell 1st Bn. (Airborne), 501st Inf. Regt. SGT Michael R. Hullender 1st Bn. (Airborne), 501st Inf. Regt. SSG Shane R. Becker 1st Squadron (Airborne), 40th Cav. Regt. SPC Lance C. Springer II 1st Squadron (Airborne), 40th Cav. Regt. SSG Nimo W. Tauala 209th Aviation Support Bn. SGT Russell A. Kurtz 3rd Bn. (Airborne), 509th Inf. Regt. SSG Jamie D. Wilson 3rd Bn. (Airborne), 509th Inf. Regt. SGT Phillip McNeill 3rd Bn. (Airborne), 509th Inf. Regt. SPC Toby R. Olsen 3rd Bn. (Airborne), 509th Inf. Regt. SGT Sean Patrick Fennerty 3rd Bn. (Airborne), 509th Inf. Regt. SPC Jeffrey D. Bisson 3rd Bn. (Airborne), 509th Inf. Regt. SPC Jason J. Corbett 1st Bn. (Airborne), 501st Inf. Regt. SPC Jeremiah Johnson 3rd Bn. (Airborne), 509th Inf. Regt. See Project Compassion portrait 3rd Bn. (Airborne), 509th Inf. Regt. (posthumous promotion to Sergeant) 1st Bn. (Airborne), 501st Inf. Regt. SGT Brennan Gibson 3rd Bn. (Airborne), 509th Inf. Regt. PFC Shawn Murphy 3rd Bn. (Airborne), 509th Inf. Regt. SSG Henry W. Linck 3rd Bn. (Airborne), 509th Inf. Regt. SSG Donald D. Griffith, Jr.
CPT William W. Jacobsen, Jr.